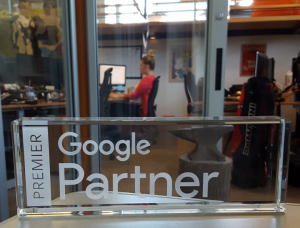 What’s a Google Premier Partner? A new recognition reserved for Google’s most valued agencies. Less than 3% of Badge Partners were promoted to Premier status. In order to become a Premier Partner, agencies were held to higher spend thresholds, higher performance standards, and more certification requirements. When you work with us, you’re working with one of Google’s most valued agencies. Google recognizes us as a top performer—because your business succeeds. We receive additional support staff (Google employees) to help us grow YOUR business—including competitive insights and industry trends not available to the public or lower level agencies.